I have only been to Washington once, but it made a huge impression. Actually, I was only in Seattle, but I need to go back and explore more of this great state. In Seattle, I got to visit with my dear friend Kim and her beautiful family. My daughter and I stayed at the fabulous Four Seasons, and visiting Pike Place with Chef Jelle of Art was a highlight of the trip. Seattle was also the launching point of our incredible Celebrity Cruise to Alaska. How could I not love this place? Kim gave me the cookbook for Christmas and I am still going through it and finding all kinds of recipes I want to try. The first one I selected was something for football food, because the Seattle Seahawks are going to the Super Bowl in a couple weeks. My husband, Bill, loves chicken wings but not the really hot ones. The book has a recipe for “Twede’s Special Hot Wings.” Twede’s Cafe is in the mountain town of North Bend and where David Lynch filmed “Twin Peaks.” Owner Kyle Twede wanted to bring people back to the cafe since the television series ended in 1991. The cafe offers more than 50 burgers, and these wonderful chicken wings. 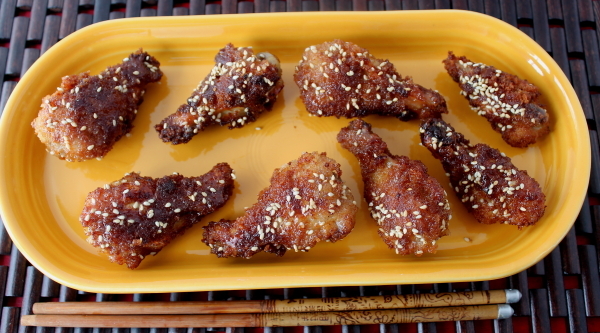 They are drizzled with a hot, tea-tinged honey mustard and sprinkled with sesame seeds. These will certainly bring people to the cafe! Bill went nuts for them and they will most likely be a staple for his game day food from now on. 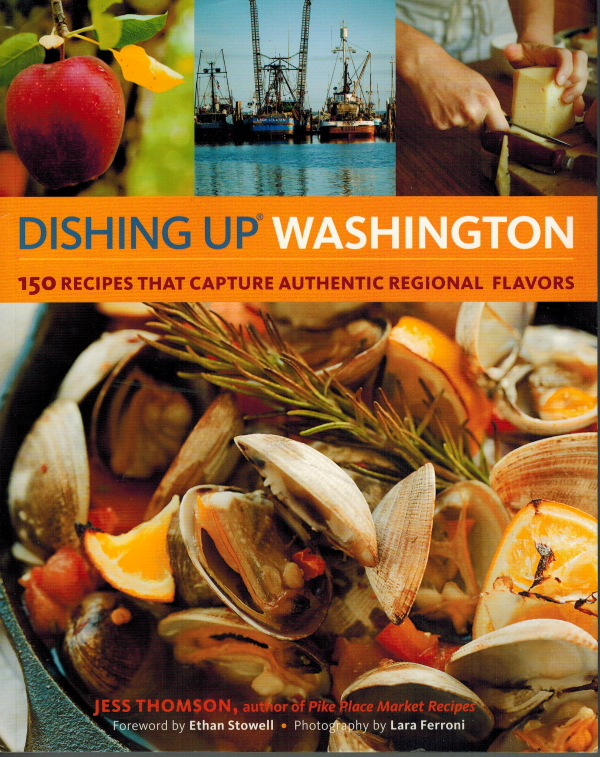 Washington celebrates its abundance of seafood, farmland, wineries, and world-class chefs in this wonderful cookbook filled with regional recipes and gorgeous photos. The book also includes a list of recipe contributors with links to all their websites and suppliers where you will be able to find ingredients. There are menu suggestions for parties and family gatherings such as a “Brunch at Home” with herb-baked eggs, a root vegetable hash, honey-pepper bacon, and a kabocha buttermilk bundt cake. For a “Big Night In with your Honey,” there is a marinated goat cheese with honey and hazelnuts, roasted chicken with honey-glazed shallots, Caesar salad with preserved lemon and bacon, and honeyed panna cottas for dessert. A Super Bowl suggestion could be the “Food for the Man Cave,” which features deviled eggs, buttermilk-battered corn dogs, garlic fries, and ice cream with a bourbon butterscotch sauce. All of these recipes are in the book along with much more. I love this cookbook and plan on using it often. I also have another book by author Jess Thomson, Pike Place Market Recipes. I think she knows Washington food! Open up a bottle of Washington wine and make one of the recipes from this book, which I think you will love, too. 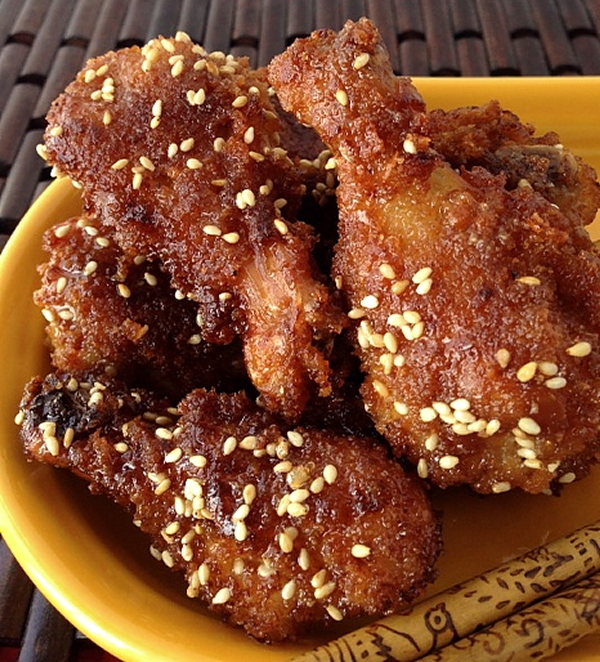 Enjoy the Super Bowl and much on these great chicken wings! Heat about 2 inches of oil in a large heavy skillet or Dutch oven to 325 degrees. While oil is heating up, whisk the eggs and water together in one bowl, and the breadcrumbs, salt, and pepper in another bowl. Working with one piece of chicken at a time, dip in the egg mixture, then in the breadcrumbs, coating on all sides. Set the coated pieces on a cookie sheet. Whisk the dry mustard and tea in a small bowl until well combined; whisk in the honey. Set aside. When the oil has reached 325 degrees, fry the prepared chicken pieces, turning once halfway through cooking, until browned and cooked through, about 8 minutes, being careful not to crowd pan. When each batch is done, place the chicken pieces on a baking rack set over paper towels. Immediately drizzle the chicken with the honey mustard and then sprinkle with sesame seeds. Turn and repeat on the second side. Serve hot. Serves 2-4. Kim, I love the cookbook, and think about going back to Seattle all the time. One of these days it will happen, and you will be the first to know! Miss you so much!